Prepare the barbecue to a medium heat. 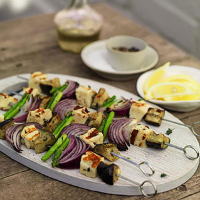 In a large bowl, toss together 250g Cypressa halloumi cheese, drained and cut into bitesize pieces, 4tbsp olive oil, the zest of 1 small lemon, 1 tbsp chopped fresh thyme leaves, 1 red onion, cut into wedges, ½ bunch halved asparagus, 1 small aubergine, cut into bitsize pieces, and some seasoning. Leave to marinate in the fridge. Thread all the ingredients alternately onto metal skewers. Barbecue for 6-8 minutes, turning occasionally, until the vegetables are al dente.